With a prolific output and catalog of beats, he has set out to release a series of limited edition 45s with brand new and never before heard music. M.A.S.H. 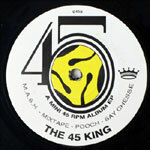 is a singlesided 45 EP of beats featuring 45 King's signature sound; breaks chopped and looped to perfection.